Well, Spring Break is about to wrap for us here. Just one day off left, on Monday (which is technically a staff day), and then back to school and back to my regularly scheduled program. I'll admit, we've been having a blast these past 2 weeks, and I'm generally sad to see it end, but this will just be a preview of Summer, so I am okay with knowing that. Wednesday I had planned, what I called, a field trip. I let Sabrina pick out her favorite Lunchables, and a side of fruit from Fresh & Easy; packed a couple of bottles of water with some ice packs in a backpack and we headed out of town with the top down. In all, the pick-your-own farm we planned to visit, the very same one from my own childhood memories with Momma, is a short drive through the rural part of the county. (I know, it's hard to believe we have rural here in Southern California, but our home town is actually the Strawberry Capital!) Within 25 minutes we were windblown and wide eyed to experience all this family run farm had to offer. 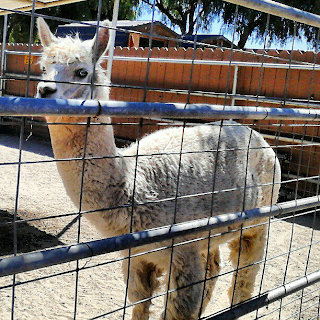 To be honest, I don't recall a full on petting zoo and, well, farm zoo, from my childhood. I would always go to the farm with Momma, who didn't have much interest in 'childish' activities, or wild animals. It was nice to be able to lazily walk the exhibits and experience them for the first time in my memory. To set foot on the farm, with the option to head into the fields to pick your own produce, it's a flat $3 a head. In all, not bad considering we killed a good hour laughing and gaping in awe at the gorgeous animals. 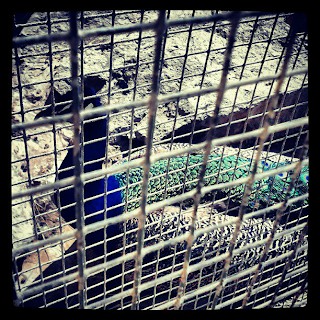 We first spotted the donkeys, and pony rides, then came the humongous Turkey and beautiful Peacock, followed by the alpaca. 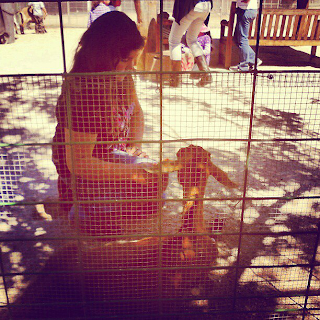 I didn't have to convince 10 year old Sabrina to visit the petting zoo. She may have been the oldest in the corral, but she also may have been the happiest with a kid (baby goat) nestled in her lap. After several playful arguments as to why he couldn't come home with us, we decided to call it lunchtime and headed to the car to recharge and refill with water. It's still fairly early in the rowing season, so much of the available produce was picked towards the middle of the crops. 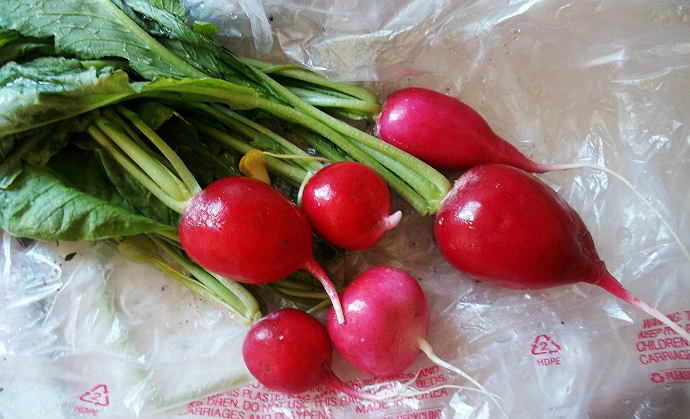 I still managed to find some beautiful radishes (I'm the only one who eats them here), and there were row upon row of Strawberries almost a mile hike back. We literally got to walk through the orchards of Valencia Oranges and Avocados to get to them! Now this was what I remembered from my own childhood; leaning over the rows of leafy green to spot that one 'perfect' berry 3 rows over. We picked until our containers could hold no more, a modest 5lbs and I was tickled to discover our cart full of produce cost less than $20! It doesn't get much better than fresh from the farm, and at an amazing deal too. Of course we perused the actual produce stand before leaving. 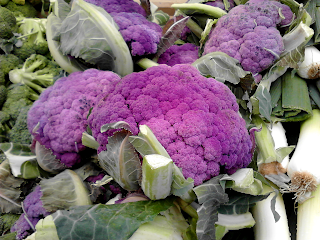 There was this curious Purple broccoli- I suppose it's quite common to some, but I was captivated by it's unusual eggplant color. When we got home Sabrina exclaimed it was 'one of the best days ever,' and begged for a fresh Strawberry Smoothie. In typical form I insisted she make it herself, to learn how. My basic recipe is Vanilla Yogurt, 1/2 Can of Sprite, Ice, and Strawberries. It was tart perfection, and the perfect cure to my slight dehydration (Note: take more water next time). No sooner had the produce been sorted and washed, and our exhausted bums plopped on the couch than we heard a rustling from the floor by the couch. Sabrina has placed her bag of berries on the floor and Truffles was in love. This cat must've spent a solid 15 minute period rolling and nuzzling the carton of berries. In honesty, we eventually took them away, as I fear she would have gone on for hours if allowed. I read up on this a little and it seems more common than not. 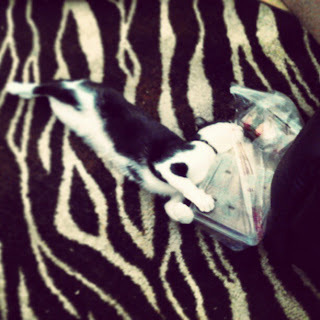 Cats are carnivores and cannot tolerate fruit/veggies well, but love to smash and roll on berries (much like catnip). Who knew? Of course I wasn't going to let several pounds of berries go to waste- On the drive home all I'd been thinking was "I must text Jay and tell him to bring home crust and dipping chocolate." It turns out we only had enough berries, once cleaned and processed, to make a pie. I've promised all parties involved we will go back to the farm real soon (June is blackberry and raspberry season) to make use of the dipping chocolate. I was a bit bummed when I actually read the tips on the pre-made crust box and decided to defrost the dough to room temperature before handling it. This made it stick when unrolling and really turned into a mess for lattice work. Oh well- it may have not been the prettiest Strawberry Pie, but it was delicious! Jay agrees but he tends to put more Cool Whip than pie on his plate, so it's hard to say whether he tastes it at all. Monday I have planned a very relaxing day for Sabrina and I with an afternoon showing of The Croods at a theater with recliners for chairs, and in-film meal service. Until then, have a wonderful weekend everyone! 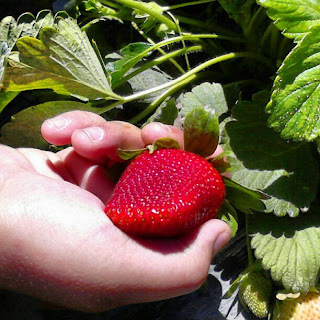 What Daughter Says: A visit to the farm fosters value of everyday foods. 1.) Combine mashed strawberries and water in saucepan and bring to a boil. Simmer for 3 minutes. Strain juice from pulp. Ensure you have 1C of Juice, add water as needed. 2.) Combine remaining ingredients with Sugar Mixture. Bring to a boil, stirring constantly, until semi-translucent and thick (3-5 minutes). Remove from heat and cool slightly. Stir in strawberries and add to pie crust. ***This filling may be served in a chilled open top pie, or baked lattice crust as shown above. To bake with pre-made crust, heat pie at 350F for 8-10 minutes, or until crust begins to turn golden brown. Aww sounds like you had a great day! And that pic of the cat with the berries is absolutely adorable!!! Ok, you need to say this post requires a bib. That pie looks absolutely amazing! That looks amazing! I always love your recipes! Yum! Yes, knowing where your food comes from - & harvesting it! - makes it more personal & valuable! i need, i want that strawberry pie now!! It sounds like you had a fabulous day! That pie looks absolutely delicious! How could you possibly have strawberries already. I am almost ready to move out there with you just so I can have good strawberries in April!! The pie looks amazing! You always have such good recipes! You can come and cook for me any day. :) Thanks for sharing all your great recipes! Yummy, Tummy my favorite use of strawberies is to cut them up mix with blueberries in a bowl and add some sugar and mix well and let it macerate overnight delicious can add other fruit if you want..
How fun! I wish we had a u-pick farm around here. And a movie theater with in-service dining?! Crazy!! holy moly that looks good! i'm gonna have to try to make this but i know it won't look as pretty as yours! love those plates too! OMG this looks amazing! I want to make it right now. yum! I love strawberry pie! Can't wait for strawberry season here. We still have snow on the ground and I'm now I'm craving a summer treat. This looks delicious, my daughter loves strawberries. Thanks for the recipe. It sounds delicious! I can't wait for strawberry season, just a few more months! I always wanted to try making a strawberry pie and you have made it seem like I could do it. It looks soooooo good!!!!!!! That pie looks amazing. 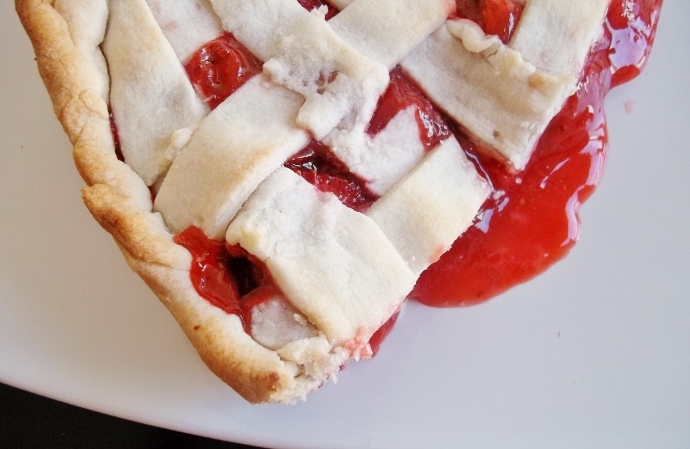 I think I will have to try making that this summer...I love strawberries and haven't had strawberry pie in way too long. This pie looks so yummy! I have always wanted to make a strawberry pie but could not find a recipe that I would like until I found yours. Thank you so much now I will definitely be going to make a strawberry pie for my family! BTW the cat is so adorable!! Sounds like a really fun day. Would you believe that I've never tried strawberry pie. I guess it's time to make one and try it out. Can I come eat strawberry pie at your house! That looks AMAZING! I love strawberry pie!!! I have never had strawberry pie. It looks amazing! I'd love a slice of this pie today. It looks so yummy. I love your photos. I have never had strawberry pie, even though I love strawberries. I really should give it a try sometime. Mmmm... That sounds sooo good.Would love to try it. I have great memories of picking strawberries with my mom too! We didn't have the petting zoo, but we spent hours picking and bonding as she taught me about fruit and how to pick the best ones. Years later I took my own daughter and passed on the lessons. I hope someday she'll do the same! The pie looks yummy. My first job was picking strawberries. Now I pay to pick my own. I love the petting zoo. I LOVE strawberries, but have never thought of making a pie using the fruit. I also like peach pie a lot. Thanks for sharing the juicy pics. And...the pic with your cat near the berries is sooo cute. I love strawberry pie. Hopefully I'll have my own berries soon. Yum ....now I could eat a piece of that strawberry pie - it looks so good. Fun time had that day it looks like - great pictures of the veggies and strawberries .Thanks for the recipe too. What a great day! Reminds me of my aunt-she would always go pick blueberries and make blueberry everything! It looks so perfect - southern domestic magazine worthy! It is greatthat you live in the Strawberry capitol of California. 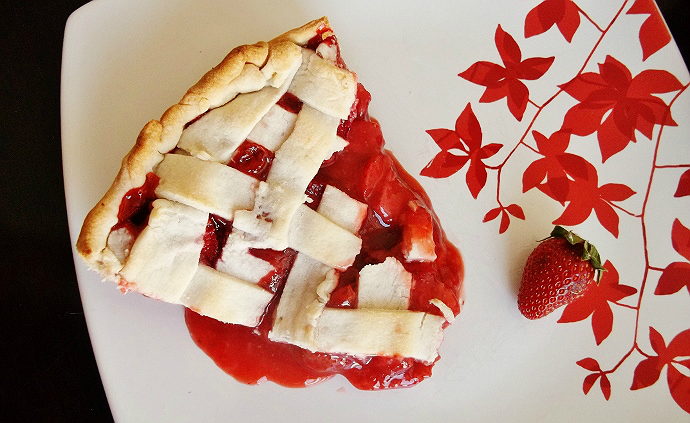 You have probably made many strawberry pies like this one. So THAT'S why my cats keep killing the strawberry plants! Who knew? Thank. 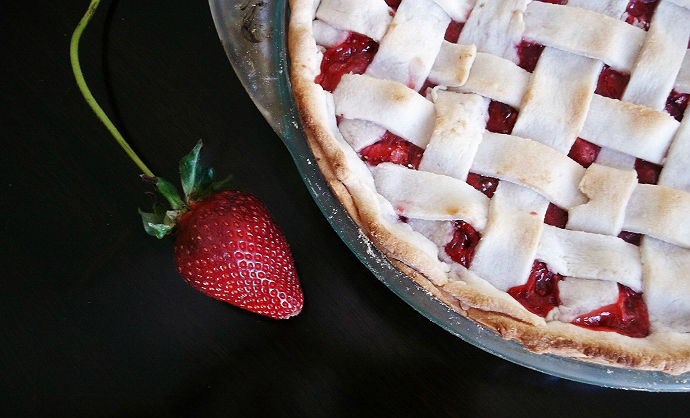 I have never had Strawberry Pie and this one looks wonderful, I will be trying out this recipe!! That looks yummy. 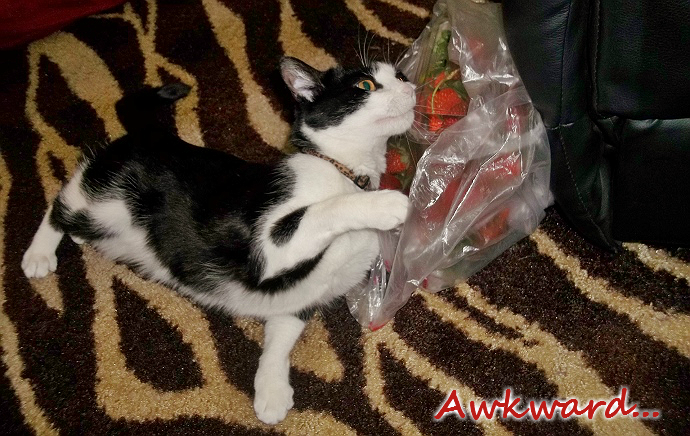 I can't believe your cat loved the strawberries so much! I love your picture of your cat! Adorable. The pie looks wonderful, I would enjoy a piece of it right now. I doubt I can make that, but it is beautiful. I've never heard of strawberry pie... Was the top lattice done cooking? It looks delicious. 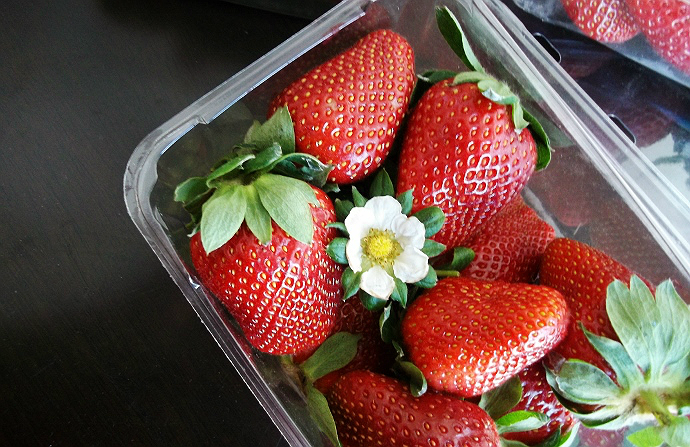 I've never seen strawberries with the stem. That was so cool! This recipe looks very tasty. Truffles looks so cute playing with the berries! I have never actually tried a strawberry pie. But the pictures look so good I will have to. I also really want to go to that farm you were on one day. Looked like a lot of fun. I cant wait until it is time to pick berries! The pie looks great and you made me hungry. PS my cats like berries too!